Make calls over the internet with a VoIP (Voice over Internet Protocol) system. Enjoy highly reliable, crystal clear call quality, reduce your telephony costs, and benefit from a fully featured, flexible phone system that adapts perfectly to your business. VoIP stands for “Voice over Internet Protocol”, which basically means phone calls made over the internet. Most people are already familiar with the concept, having made calls using Skype or similar services, yet they haven’t considered using VoIP for their business phone system. One area of concern is call quality and reliability and that’s why it pays to choose a business-grade service, rather than a free option. Business grade calls use a bandwidth of 100K bits per second upload and download, whereas free services can compress calls down to as low as 15Kb/s (hence the reason why they are free). This can obviously make a world of difference to call quality and reliability. A business-grade call is indistinguishable from a ‘regular’ phone call. In fact, a large proportion of all calls are already transferred over the internet at some stage, without callers ever noticing. The technology behind VoIP is reliable and stable, so your calls will always be of the highest quality. VoIP is becoming more and more popular as business users become aware of the huge cost and flexibility advantages it offers. It is fast becoming the default way of routing phone calls and will be the standard in the very near future. To make and receive VoIP calls you can use any VoIP enabled device. This is usually a VoIP phone, which works the same way as a regular phone, except it routes calls over the internet instead of down a regular phone line, although some hybrid phones do both. Another option is to use a computer (as with Skype), or you can even download an app on your mobile which allows you to make VoIP calls wherever you have a wireless connection. Really, the only limiting factor when using VoIP is the bandwidth available to you. If you live in an area with a poor internet connection VoIP may not be the best option. At Callagenix, one of the first things we do when somebody enquires is to check the connection speed is suitable before even considering installing a VoIP system. However, even high-quality calls don’t take up a lot of bandwidth, so anyone with a half-decent internet connection should be able to get a top quality, reliable service. By the way, if you want to run a quick test on your existing connection you can get a reading from a few broadband speed checking sites and then take an average. We also install a dedicated line just to handle your calls, so there is no chance of interference from other internet use, such as people watching videos or downloading / sending large files. Just consider – at a time when most people can download and stream High Definition films without any issues, making and receiving high quality calls is usually not a problem. 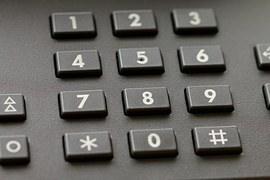 An IP Telephone device (either a dedicated phone or a headset) together with specialised software converts your voice into a form that can be transmitted via the internet (or network) to a Callagenix service or to another person with a Callagenix IP Telephony setup or to a normal phone line. The Callagenix VoIP service is a business-grade service, meaning it is highly reliable, with call quality indistinguishable from 'normal' phone calls. As long as you have a fast and reliable broadband connection, you can enjoy top-quality VoIP calls and a wide range of advanced features for a fraction of the cost of a traditional phone system. In most cases we recommend an additional dedicated broadband connection if you have a number of people needing to make calls. This ensures a high level of call quality and prevents any issues caused when users are using the same connection to browse the web and possibly upload / download large files etc. VoIP calls between users on the same network are totally free. You can easily connect multiple sites under a single VoIP system, as well as homeworkers. It's even possible to connect users via a downloadable smartphone app so they can enjoy VoIP calls wherever they can connect to a reliable wireless network. Talk to other Callagenix IP Telephone numbers without incurring call charges. Inbound calls from any Callagenix number can be diverted to a Callagenix IP Telephony device free of charge, saving on divert charges (see costs). Dial any phone number making use of Callagenix rates. To get started with VoIP, please call +44 (0) 333 247 00 00 or click here. • Broadband or a pub? • What’s your line speed?